Have you ever thought about becoming a coach? Not necessarily a sports coach, but one who can inspire and mentor business wannabees to fulfil their potential? Karen Williams is a business mentor and coach who has trained to be an NLP (Neuro-Linguistic Programmer) master practitioner. NLP is described on Wikipedia as “…a model of interpersonal communication chiefly concerned with the relationship between successful patterns of behaviour and the subjective experiences underlying them…” This basically means that NLP is about linking how we react and communicate theoretically with the personal experiences of the same action. By doing this an NLP practitioner hopes to build more effective process models that will help an individual be a more successful person. 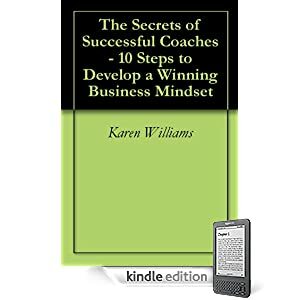 In her book “The Secrets of Successful Coaching”, Karen Williams identifies 10 steps that will help you develop a more complete and valuable way of working that will help forever. From identifying how to recognise your assets to developing professional networks to support your progress, this book pitches at the right level to help anyone who is considering using NLP. A clear selling point of the book is the inclusion of 10 people that Karen Williams uses for her own guidance – something that the reader can do via the ‘Further Resources’ chapter at the end of the book. It has value because it provide linkage back to not one author and practitioner, but an industry that takes itself very seriously indeed. It is always nice to see a book that is arranged with bite-sized chunks of information that can be digested easily, and this one is no exception. The book also requires a little interactivity with examples followed by questions that need answers. By answering, the reader demonstrates knowledge and this is important in the quest to provide quality coaching. There are a few coaching books out in the marketplace, but this one provides value by way of truly trying to understand the reader and make their business life a better place.